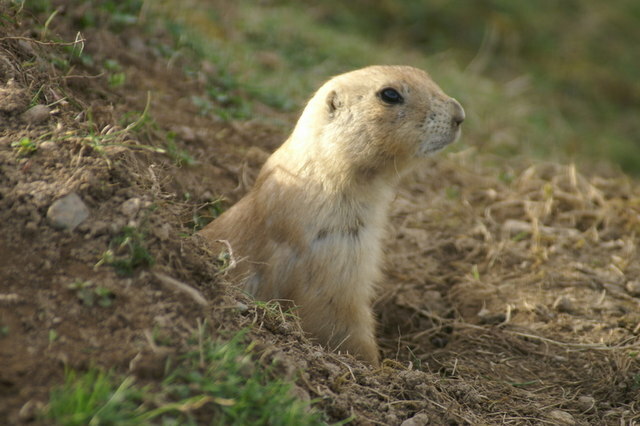 There are 5 species of prairie dog. Members of the squirrel family. Whilst largely herbivores, they have also eat insects and the flesh of their dead. Eat grasses, roots, weeds, ferns, blossoms. Get all the water they need from the food they eat. Live in burrows with extensive tunnels and multiple openings. Burrows have separate nurseries, sleeping quarters and toilets. Burrows may be shared by snakes and burrowing owls. Are sociable and live in closely knit family groups called 'coteries'. Main predators are eagles, coyotes, hawks and snakes. Say hello to one another by kissing.